When visiting Pentwater, there are endless options for recreation and entertainment. 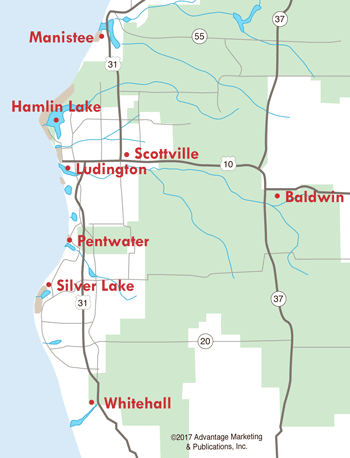 Whether you enjoy browsing the artisan shops and galleries, or just relax in a local restaurant or pub, there's no other place quite like Pentwater, Michigan. Be sure to walk along the channel to the Pentwater Lighthouse and watch the boat traffic to Lake Michigan, or visit a concert or arts and crafts fair on the Pentwater Village Green. Check out the Festivals & Events page for a perpetual calendar of monthly events, the Calendar of Events page for dates and times, and the Family Friendly Events page for fun things to do for families and kids! Enjoy Silver Lake and the sand dunes at Parrot's Landing. Our recreational rentals provide thrills on sand or water. Rent or take a guided tour in a 4-door Jeep Wrangler. Ski boats with tow tubes and jet skis are also available for rent by the half day or full day. Charles Mears State Park offers 175 paved campsite lots and a nice sandy beach along Lake Michigan, adjacent to the North Pierhead Light. There is a one mile interpretive trail for hiking, and a sand dune called Old Baldy that provides a spectacular view of Lake Michigan. Visitors can enjoy a playground, picnic shelter, great fishing, and even a metal detecting area. The park also has an accessible walkway by the concession stand, making it easier for people in wheelchairs or those with strollers and coolers on wheels. "Bringing History to Life!" A step back in time in a picturesque setting for the entire family. Tour historic buildings. Visit the old-fashioned ice cream parlor. Interact with characters in period costume as they provide a 1st-person interpretation of pioneer life in the late 1800's/early 1900's. Special events throughout summer and fall. If you love the thrill of climbing a sand dune and enjoying a beautiful panoramic vista, then visit this website about Lake Michigan's most popular sand dunes including Sleeping Bear Dunes National Lakeshore, Nordhouse Dunes Wilderness, Silver Lake Sand Dunes, and more. Pure Michigan sugar beach sand, clear waters, magnificent sunsets...discover Lake Michigan Sand Dunes. What's a family to do in West Michigan? We've got the answer at Lakeshore Family Guide, a local website which highlights fun, wholesome, and inexpensive activities for children and families. Includes details about kids programs at the library, mini golf courses, petting zoos, the best beaches, and so much more! Enjoy your favorite music every Thursday night at the Village Green from 8-9pm. The Pentwater Civic Band plays all your favorites, and this free event is a great activity for the entire family. Bring your lawn chair or blanket and sit back while show tunes, marches and patriotic songs fill the air. Cruise across Lake Michigan on the S.S. Badger carferry and explore Wisconsin.